The 2011 HSBC/McKinsey Business Case Competition was successfully held on 1 & 2 June at The University of Hong Kong. Organised by the Asia Case research Centre, Faculty of Business and Economics and sponsored by the Hongkong Bank Foundation and McKinsey & Company, Hong Kong the competition aims to bring together students from around the region, and give them the opportunity to stretch and apply their quantitative, qualitative and communication skills. This year, 16 teams from as many universities competed for the championship including first time participants Yonsei University, National Chengchi University, Tsinghua University, Peking University and Fudan University. After an intense two days of competition, in which four business cases were presented to 35 senior members of the region’s business community, the National University of Singapore won the championship. 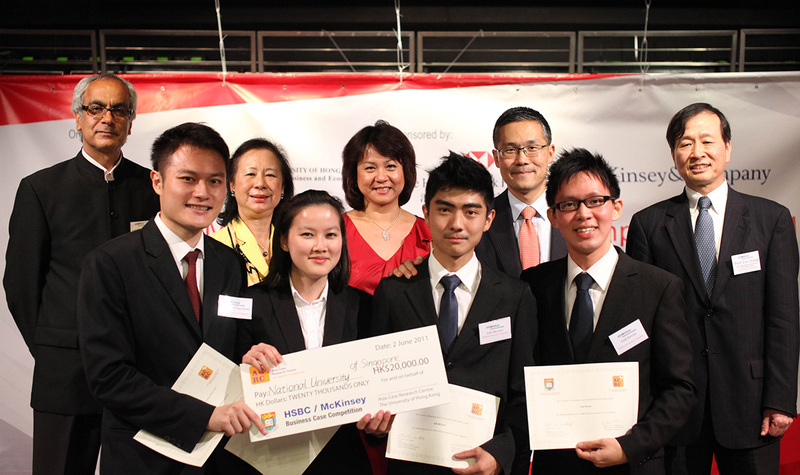 Members of the winning team were awarded internships at HSBC and McKinsey as well as a check of HK$20,000. As the first runner-up, Tsinghua University was awarded a check of HK$10,000. Copyright © 2019, Asia Case Research Centre, Faculty of Business and Economics, The University of Hong Kong. All Rights Reserved.